Here's a whole series of pictures (in reverse chronological order) I took a few weekends ago when the snowy egret was fishing outside my condo window. 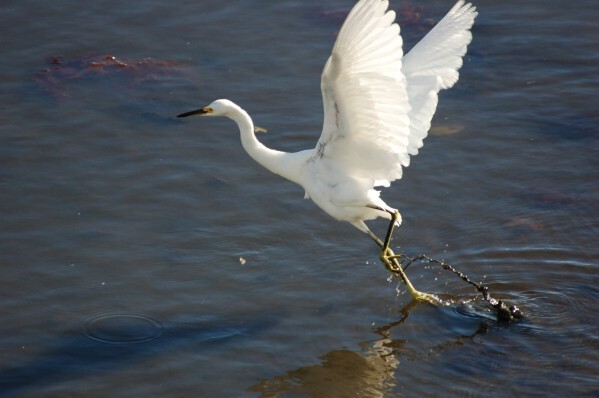 The one thing all the pictures have in common is the egret was jumping. At one point I planned on weeding out some of the pictures, but I found I enjoyed looking at the whole series even though they aren't great photos (and I'm not the best at making choices like that), so I finally decided to just post the whole batch of them. Some of the pictures remind me of snippets of certain karate kata. I included the last photo with a mallard duck also in the frame just to give a better idea of how small the egret actually is. Note: I moved all the photos to another web page so the viewing of this page wasn't so slow with all 20 photos. If you want to see all 20 pictures, click here.